Holli and Gaby make up what is Hot Mess Mayhem. Two young mom’s who love all things beauty related and are trying to keep it all together while doing it. Chasing little kids and teenagers around is why we are hot messes, and beauty is the escape from all of the mayhem of our everyday life. From finding cool, new affordable products at the drugstore to hitting high end shops and grabbing the hottest new release, we follow and do it all. But, beauty is not just on the outside, beauty starts on the inside and makes it way outwards. Products (and an occasional cookie) that can help us take care of our inner beauty is something we are always on the hunt for. Won’t you join on us our quest to lessen our daily mayhem and calm the hot messes we have become from it? Visit Gaby's YOUTUBE Channel for great tutorials and a little silliness! Have suggestions on products we should review? Email us here! If you are a company or brand owner and wish to collaborate, please send us an EMAIL HERE. 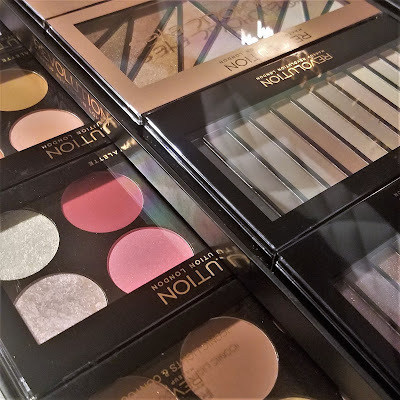 Amazing product vault from Makeup Revolution! HOTMESSMAYHEM. Awesome Inc. theme. Powered by Blogger.